The probate and wills at the Archives date from 1847 to 1917. These records were microfilmed with the exception of the Second Circuit Court probate case files and minute books. They were selectively filmed by the Church of the Jesus Christ of Latter Day Saints (Mormon Church) ca. 1970. Records were selected for microfilming based on the genealogical information content of each document. Therefore, the microfilms may not provide complete documentation relating to each case file. Wills admitted to probate may be located within probate case files. Adoptions and guardianships were filed with probate cases starting in 1859 when judges were authorized to legalize adoptions. You can search the Ulukau website for the citation that you will need to find the documents on microfilm, which is the court (First, Second, Third, etc.) and case number (i.e. 17, A11, 295). Documents are in Hawaiian and English. 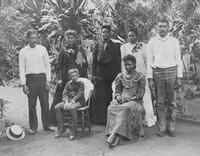 Some Hawaiian documents have been translated to English by the courts and Archives translators. More information about Probates/Wills by Circuit Court.